H1 – “To demonstrate a positive impact on student learning, teacher candidates honor student diversity and development.” (Seattle Pacific University). This standard implies that each student has a unique set of personal and developmental differences where teachers can use recent and relevant research to positively impact student learning. Stress is a relevant and very real part of students lives. The impact of such stress has adverse effects on brain development and learning (Medina, 2008). Educators should use research based strategies to be aware of student stress and learn how to assist students in maximizing learning potential. 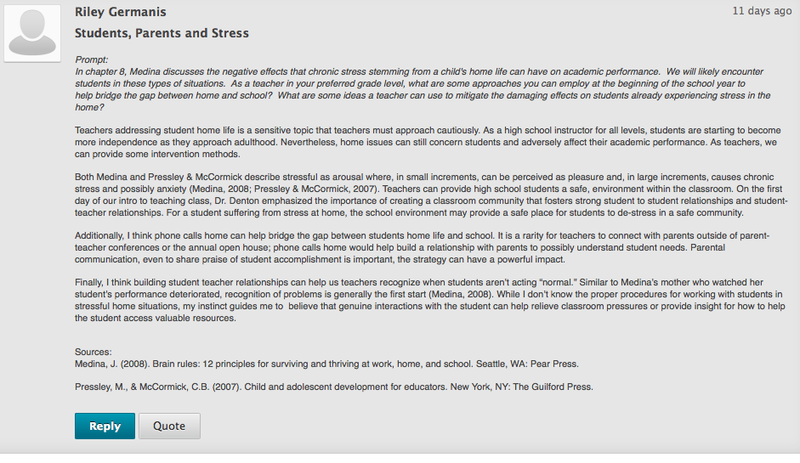 The following screenshot is taken from a class discussion board which demonstrates my understanding of research showing stressful home live and the impact on student development within the classroom. In this piece of evidence, I discuss how creating an inclusive classroom community can negate some of the harmful effects induced by stress. This is relevant to the H1 program standard since unique home experiences can directly impact student learning and educators should address the effects of developmental challenges students face, even when they are beyond the control of the teacher. In writing this post and discussing the impact on student experience, I made new connections with the importance of creating a classroom community to help students overcome stress from outside the classroom. When students have a safe classroom environment, even with uncontrollable stress, students can continue to learn and develop in content areas. Awareness of student stress and getting to know students can positively impact student learning. In my classroom, I will create a learner friendly environment to foster learning. Additionally, I will use best practices to engage my students with multi sensory lessons (Medina, 2008). By increasing engagement in learning, no matter the situation, students will learn more (Borich, 2014). Classroom communities and sensory integration in learning all provide opportunities for students to engage in the content and increases learning. There are many other social issues classroom teachers have the opportunity to impact. Using research based strategies to impact the community will positively influence student development. Seattle Pacific University (n.d.). HOPE Standards. Seattle Pacific University School of Education. (Accessed Aug. 2, 2014). This entry was posted in H - Honor student diversity, development and their right to learn, H1 - Honor student diversity and development and tagged development, EDU 6132: Learners in Context, effective teacher, engagement, Medina, reflection, stress. Bookmark the permalink.